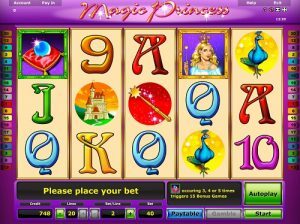 Once upon a time at NovomaticCasino.co.uk, there was a slot game called Magic Princess which entertained its players and gave them lots of wins! Thankfully, this game is still here and you can play it for yourself! Fans of Cindereela and Lucky Rose are sure to love this delightful, fairy tale-themed slot game, brought to you by NovomaticCasino.co.uk. With castles, crowns, kittens, peacocks, magic wands, crystal balls and beautiful princesses, this game has everything a girl could wish for – except the handsome prince! When you wish upon Magic Princess, you’ll be sure to make your dreams come true. With 5 reels and 20 paylines, there are plenty of ways to win! The aim of the game is to spin two/three or more matching symbols on an active winline, and they must be on consecutive reels from left to right, in order to get a payout. Symbols range from the classic card values, to more lucrative fairy tale-themed symbols. You can check the paytable whenever you want to see how much each combination of symbols is worth, according to your bet. You can change your bet if you’d like by using the plus and minus symbols to increase or decrease the number of lines you wish to bet on, as well as how much you wish to bet on each of those lines. The value you decide will be displayed for you at the bottom of your screen, along with your balance and the amount of your last win. Like many other NovomaticCasino.co.uk slot games, you can play Magic Princess for fun until you feel ready to play with and win real money. Once you’re more familiar with the game and you’re happy with how it works and with your bet amount, you can put the game into ‘autoplay’ mode where the reels spin themselves, and it saves you from having to keep clicking with every spin! Out of autoplay mode, you can gamble your wins. Every time you get a payout, you can choose to collect or gamble it. If you choose to collect it, it will be added to your balance. If you choose to gamble it, you’ll be taken to the gamble game. Here, there are different steps you’ll need to climb to win! To get to the next step and double your money, you’ll need to click while the light flashes on. You have a 50/50 chance or doubling or losing your win – magic can’t help you here, so be fast with your fingers! There are two special symbols in Magic Princess. The first is the beautiful, blonde princess herself who not only gives generous payouts but who also can substitute for any other symbol in the game, except the Scatter symbol, and when she substitutes in a winning combination, she pays x2. The other special symbol is the Scatter symbol. This is the crystal ball and, unlike the other symbols, this pays wherever it lands on the screen. When you spin three or more crystal balls, you’ll be rewarded with 15 free games! During the free games, your wins are multiplied x3 and you can win more free games by spinning another three or more crystal balls in one go! Here at NovomaticCasino.co.uk, we have so many slots, video slots, table games and live dealer games that you’re sure to find the perfect game and playing it will be like tasting true love’s kiss! Our live dealer games are especially cool and, using the latest technology, we can offer our players: Live Baccarat, Live Blackjack, Live Poker and Live Roulette!